Eating healthy does not mean giving up dessert. In fact some of my go-to sweets actually aren't all that bad for you. I've compiled 3 of my favourite homemade dessert recipes that are packed full of nutrition but definitely satisfy any sweet tooth. Nothing beats a good chewy cookie and this one is full of only healthy ingredients. So you can eat that second, or third cookie, without feeling guilty. It's puffed up with oats rather than heaps of flour, sweetened with banana instead of sugar and the peanut butter is the fat instead of oil. You can get the full recipe here. You know how pumpkin spice became such a huge thing? Because they're onto something with the whole pumpkin being used in desserts... It's a vegetable so, by its very nature it is great for you but the sweetness works so well in a cake. It makes it incredible moist and dense without all the calories of butter and sugar to moisten and sweeten. You can get the full recipe here. 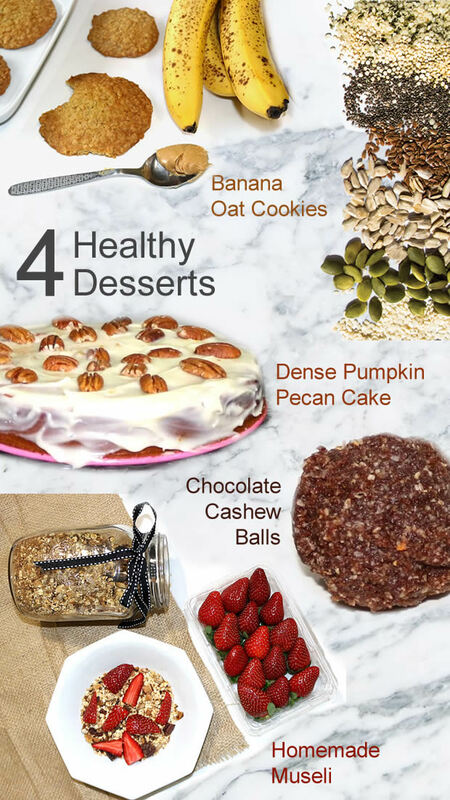 These delicious healthy dessert balls are made from just four ingredients! Dates, cashews, cocoa powder and coconut oil. They are packed full of healthy fats and taste delicious! Would highly recommend making them in a huge batch to eat throughout the week as snacks or freeze some for late night treats. You can get the full recipe here. The issue with eating store bought muesli a lot of the time is that it is packed full of sugar. Sure it tastes great, but do you really want to be shoveling sugary muesli down your throat first thing in the morning? Make your own muesli and have your sugar naturally through fruit. This recipe sneaks in a heap of nuts and seeds for extra protein and healthy fats. You can get the full recipe here.